No Yucca Mountain? No backup plan? Then the Department of Energy can’t force utility customers to pay into a construction fund for a nuclear waste repository that no longer is on the boards, a federal court ruled Tuesday. 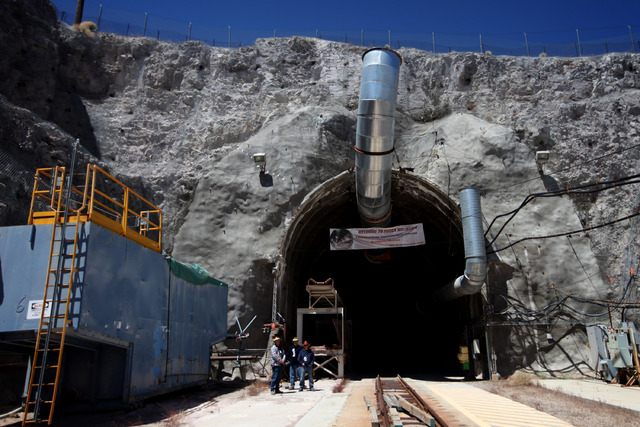 WASHINGTON — No Yucca Mountain? No backup plan? Then the Department of Energy can’t force utility customers to pay into a construction fund for a nuclear waste repository that no longer is on the boards, a federal court ruled Tuesday. The department has failed to come up with a credible estimate of how much money it will need to carry out a nuclear waste program now that the Nevada site has been scrapped, according to judges in the U.S. Court of Appeals for the District of Columbia. Consequently, a three-judge panel ruled unanimously the department should not collect the fees and should ask Congress to pass a law to halt them. The ruling was seen as a victory for utilities and a setback for the Department of Energy that has continued to amass a fund as it struggles to develop a new plan to dispose of high-level nuclear waste. “Consumers have upheld their end of the deal, but unfortunately all they have to show for their investment is a hole in the Nevada desert,” said Charles Gray, executive director of the National Association of Regulatory Utility Commissioners that sued the department. Department leaders were studying the ruling and had no immediate comment, a spokeswoman said. The department had argued it was necessary to continue collecting fees because the money eventually is going to be needed whenever a new nuclear waste program is put together. The government collects $750 million a year into the nuclear waste fund through fees charged to customers of utilities that generate nuclear power. About $35.8 billion has been collected since 1983, and annual interest on the fund is $1.3 billion. The fees were authorized to build a repository for the utilities’ waste. But when President Barack Obama scrapped Yucca Mountain, about 100 miles northwest of Las Vegas, soon after taking office in 2009 and set off to find a new strategy, utilities balked at making more payments. About $10 billion has been spent from the fund, according to the Nuclear Energy Institute. The court earlier ordered the Department of Energy to update its estimates of how much it might need to collect, but the it came back with a cost range “so large as to be absolutely useless,” according to the seven-page ruling written by Senior Judge Laurence Silberman. Contact Stephens Washington Bureau Chief Steve Tetreault at stetreault@stephensmedia.com or 202-783-1760. Follow him on Twitter @STetreaultDC.